Are Old Theater Passes Collectible? Everything is collectable to someone. The greatest value is not monetary however, it historic. Consider donating them to the Roanoke Library’s Special Collections where researches can find them. To a researcher or writer it is great to know that Miss Davidson was an organist at the Rialto. That she attended a movie at the Park Theater where S. G. Richardson was manager. 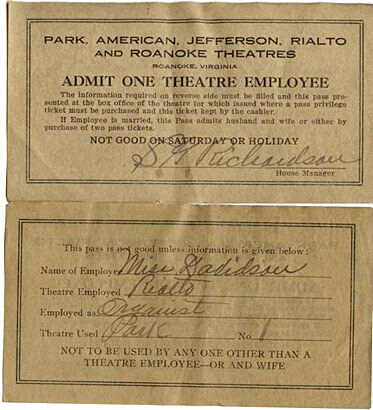 It shows that, at a point in time, one management company operated the Park, Rialto, American, Jefferson and Roanoke Theaters. I’m only sorry to notice that Miss Davidson attended the movie alone. A good writer could get a 500 word story just out of this one pass.